Unless the Federal Government announces a new minimum wage, organised labour will embark on an indefinite strike from November 6, 2018. "If nothing is responsibly done by the Federal Government to meet our demands, on Monday, the 6th day of November, we shall embark on a nationwide strike to compel this government to show more sensitivity to the plight of Nigerians and the suffering that is decimating our people on daily basis," said a statement by labour leaders. The statement was signed by the president of Nigeria Labour Congress (NLC), Ayuba Wabba; his Trade Union Congress (TUC) counterpart, Bobboi Kaigama; and president of the United Labour Congress (ULC), Joe Ajaero, in Abuja, yesterday. A seven-day warning strike it staged earlier was called off September 30, three days after it began. 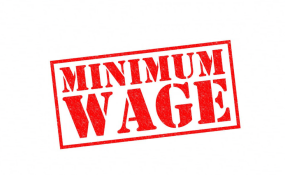 Labour had wanted the Federal Government to reconvene the tripartite national minimum wage committee. The organised labour denied government's argument that the committee did not agree on a figure during its last sitting. "We accepted N30,000 as a compromise to demonstrate the willingness of Nigerian workers to make sacrifices towards nation building. Anything to the contrary, no matter the quantum and character of the din or how well couched it may appear, cannot be true. Resorting to Goebbelsianism at this time of national emergency, which requires men and women of integrity, is rather unfortunate and cannot suddenly make the brazen falsehoods truths." The labour leaders said: "We cannot continue discussing a figure that has already been agreed procedurally within the committee. What we are waiting for is for the Federal Government to immediately set in motion the necessary machinery for turning the agreement into a bill for onward submission to the National Assembly, where we expect the presidency to work together with the legislators to make it a law so that it can be implemented quickly. "We are not amused by the feeble and laughable attempt the Federal Government is making to intimidate and cow the trade union movement and its leadership in the country all in a bid to subjugate the will of Nigerian workers over the national minimum wage. Let us today remember those who deny us and let us collectively demonstrate our position at next year's polls." Confirming the outcome of the last meeting on the proposed figure from the Organised Private Sector (OPS), the director general designate, Nigerian Employers Consultative Association (NECA), Timothy Olawale, told The Guardian: "We have concluded. We have a majority figure which was N30,000, which was what we all agreed on. However, there was a minority voice from the Federal Government that it would not be sustainable for government and they proposed N24,000. But we insisted that we were closing discussion and we were leaving it at N30,000." Olawale however pleaded with the organised labour not to embark on strike, adding that if it does, the private sector should be excluded. The Non-Academic Staff Union of Universities and Associated Institutions (NASU) meanwhile has berated the Federal Economic Council for approving 15 per cent of the annual budget for education at the twilight of the current administration. The general secretary of NASU, Peters Adeyemi, said 20 per cent would have been more appropriate because given the low budget of the country, a mere 15 per cent would not make noticeable impact. He said: "The so-called 15 per cent is even grossly inadequate because right now, what our universities are doing is to rely on the Tertiary Education Trust Fund (TETFund) to bridge the gaps that have been created as a result of inadequate funding. Government talks about intervention funds, which is a clear admittance that government is not funding education properly through the budgetary system. I think if government is serious about funding education, they should start from 20 per cent to make any impact. In fact, we need to ask the 15 per cent or 20 per cent of what? What is even the size of the budget itself for the percentage allotted to make sense? So, the size of the budget determines the quantum of impact that is expected. Right now, our budgetary allocation cannot be said to be extremely high."